What is skinning and why is it so difficult to master? Skinning is the process of assigning the vertices of a mesh to an animated skeleton structure. The mesh should deform and follow the movements of the skeleton accurately, creating realistic looking movements of organic shapes. The skinning process is an important part of character creation and requires artists to interrupt the more creative parts of their work and spend often significant amounts of time on rather technical and repetitive deformation set-ups. Especially for less technically inclined artists the skinning task can quickly turn into a long and tedious journey through of bone influence area tuning and deformation readjustments. BonesPro delivers fast results through a quick assignment set-up and convenient adjustment options. 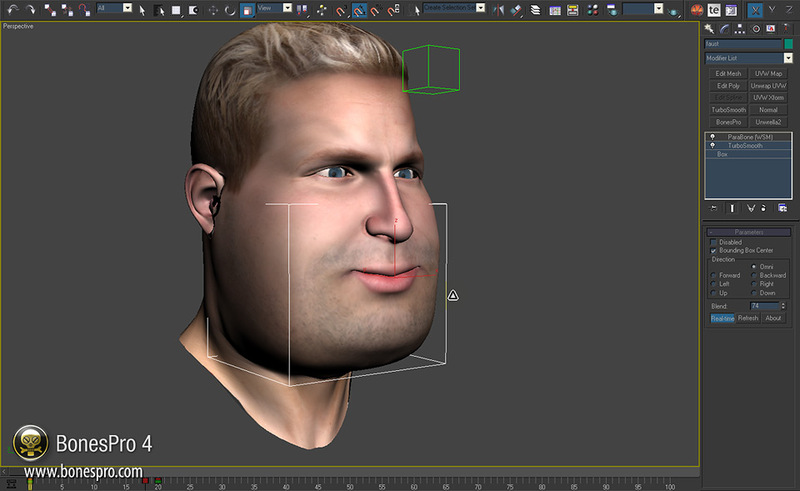 Meshes deform like elastic skin, avoid face clipping and don’t tear vertices too far apart from each other. Hypodermic solid deformers can handle the most problematic areas in an animated mesh. API access allows integration into existing pipelines and Teams can collaborate on scenes without having to supply everyone with licenses. BonesPro can not only be used for traditional skinning but also for many other animation effects. A big problem for artists are sharp bends in the skin, for example in the elbow region of a character. 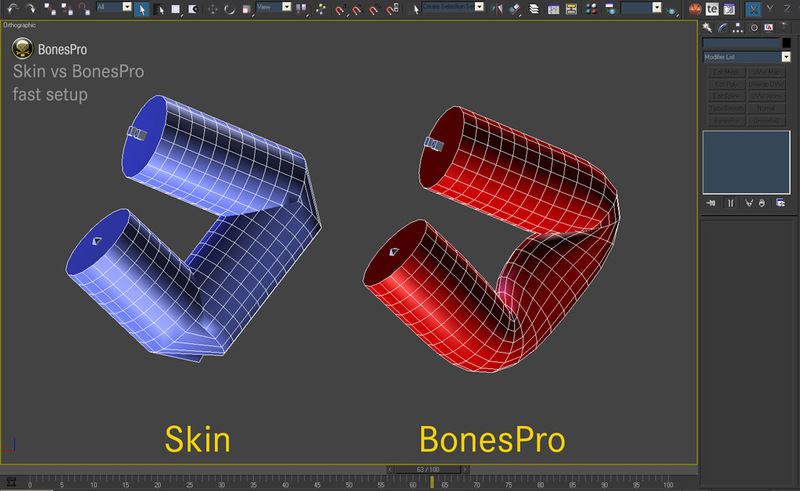 Polygons clip into each other, the tip of the elbow looks too rounded and has no clear bone protrusion against the skin. For those situations BonesPro offers you MetaBones and ParaBones. They give you absolute freedom to tune skinning results, pad the mesh in specific areas, create skin blockers and emphasize bone structure under the skin. They are fully animateable, allowing artists to create astonishing deformations beneath the mesh. The skin will consider these objects as physical objects and stretch over them like real skin stretches over an elbow or knee. Create a mouse sneaking around under the carpet, pulsing veins or even a parasite moving under the skin. MetaBones are lightweight spherical objects that can be used for basic mesh deformations. Elbows, knee caps and finger joints can quickly be given a realistic form when bent by placing a few MetaBones under the skin to simulate a real bone pressing against the skin during movement. ParaBones work similar to MetaBones but instead of a simple spherical shape you can use any mesh you want and have the skin stretch over it. This gives you the freedom to implant anything imaginable into your characters. A ribcage pressing against the skin or emphasized shoulder paddings under the clothing. BonesPro uses advanced blending calculations. This avoids ugly intersecting faces, exploding elbows or trails of unassigned vertices of fingers flying across the scene. Meshes stretch like elastic skin, bend smoothly over user defined sub-dermal implants and additional options allow deformation effects like chest movement based on a character’s breathing to be added dynamically. You can at any time display a visual representation of the deformation forces in the viewport. Visibility of the mesh, bones and any hypodermic deformers can be quickly adjusted to ensure always an optimal overview of the components that you are currently working with. In areas where the basic bone influences are not optimal you can easily override this setting completely or just partially to adjust the skinning result. Fine tuning specific areas does not invalidate the automatic influences and you can at any time go back and re-adjust the total influence a bone has over the mesh. What are secondary motion effects? This option allows you to add a motion delay to specific bones in order to invoke the impression of higher mass in parts of the animated mesh. This allows you to add movement independent motions to the bone that are played even when the skeleton is standing perfectly still. Add a rhythmical motion to the torso to simulate breathing or a very fast effect to make the character tremble. We have created a compatible solution for all artists and studios working with external freelancers or third-party render farms. Plug-ins often cause problems when the scene files are opened on other computers where not all required plug-ins are installed. To solve this we have created a replacement BonesPro plug-in that can be downloaded and used freely as a replacement for the normal version. 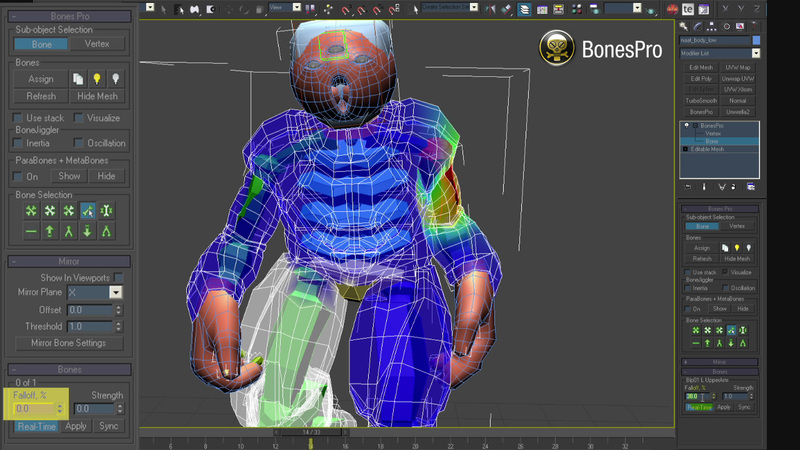 It allows artists who don’t have a BonesPro license to open and work with scenes that include BonesPro skinned meshes. This enables one artist to use BonesPro to skin a character and another artist can later open the scene and work with that character (for example animate it or edit materials) without needing a BonesPro license. This also optimizes render farm administration. Machines that are just used for rendering don’t need to be burdened with license management or complicated setups. 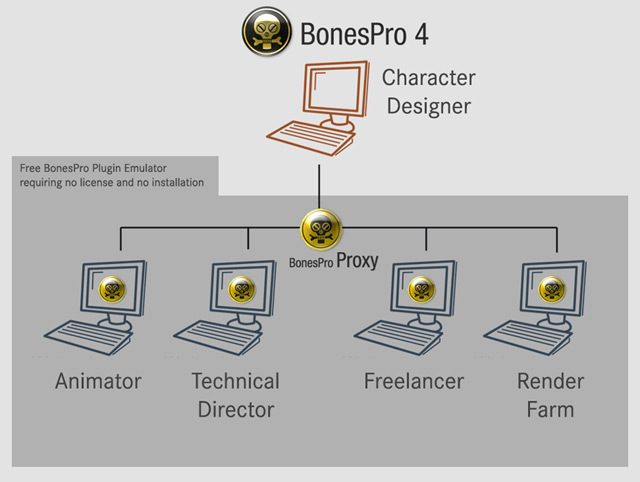 Just having the BonesPro Proxy available in a local or network plug-in directory is all it takes to render any animation that uses BonesPro skinning. BonesPro can be integrated into existing workflows and production pipelines. The modifier and its data can be accessed through MAXScript or c++. This allows you for example to export the final weight data of skinned meshes into a real-time game engine. An integrated converter for the standard Skin modifier simplifies pipeline integration in a lot of cases. 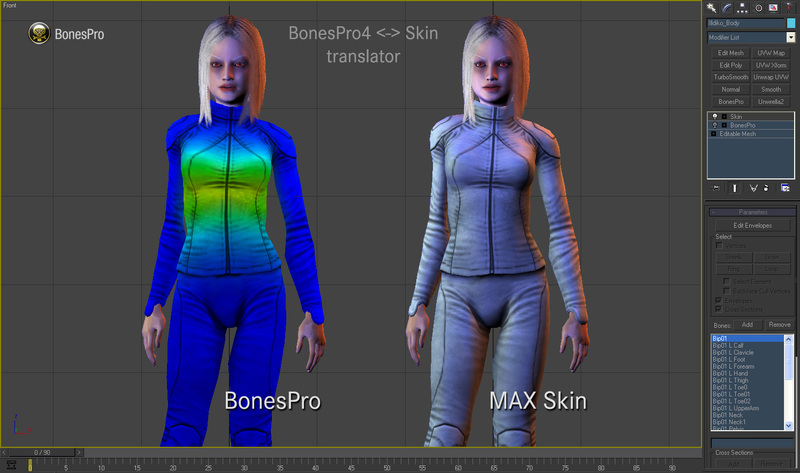 Instead of having to use custom exporters to transfer the BonesPro results into other software BoneSPro users can convert their work to the Skin modifier with a simple button press to take advantage of existing functionality for Skin like using the FBX format or directly exporting to game engines that support Skin, etc.